In a bowl, soak the almonds in the boiling water for 30 minutes. Drain. In a blender, puree the almonds and 1 cup of the milk to a fine paste. In a saucepan, combine the paste, the remaining milk, saffron threads, sugar, and cardamom, and simmer over medium heat for 20 minutes, bringing the mixture to a boil. On a cold winter night, serve this drink hot, or in summer, serve cold over ice. 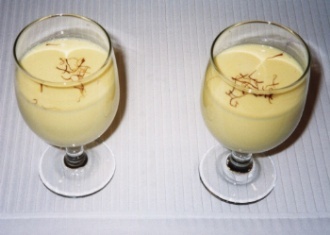 Saffron threads impart a beautiful orange-yellow color and distinctive flavor and aroma to this refreshing drink.